There is absolutely nothing more important to the exterior of your structure than protecting its finish against the harsh New Mexico elements. Sealing out the elements and staying beautiful for a long time depends upon choosing the correct products for your exterior finish. So we have done our homework. Our stucco products were developed by a global company with 100 years of experience in designing and testing the best products on the market today. They are confident enough in their products to back them with a 10 year written warrantee. 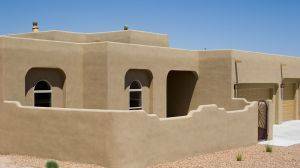 Our stucco professionals have made a career of providing the highest quality workmanship. Some of you have been absolutely impressed with not only the quality of work but by the care taken to leave your property in pristine condition.